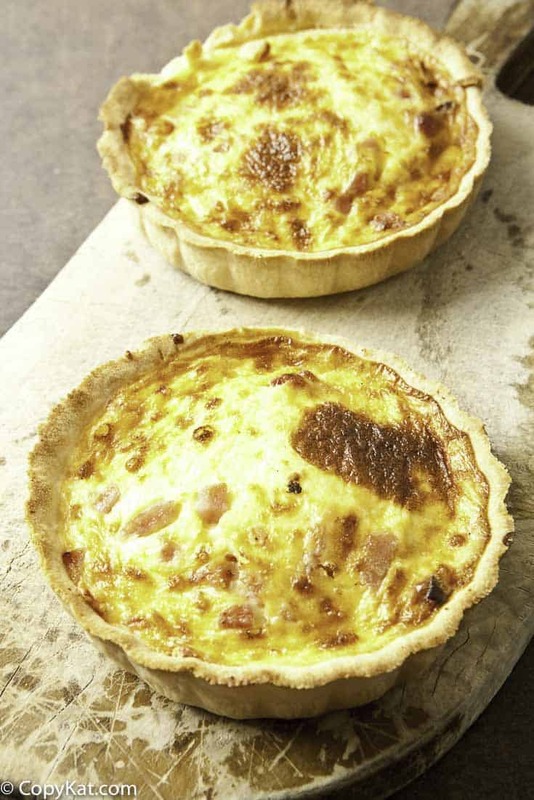 La Madeleine Quiche Lorraine makes for a delicious lunch or even a hearty breakfast. If you aren’t lucky enough to live near one of these fine restaurants, you can make a quiche just they do. If you have never had this egg delight before it is a style of quiche that gets its name from the bacon and Swiss cheese that is added to this. We now believe that quiche came from France, but before the French put their own stamp on this recipe, they added the cheese. The Germans originally created an unsweetened custard pie with smokey bacon. Thanks to both of these nations we have one of the best way to prepare eggs imaginable. Quiche ingredients are easy to find! Their quiche is served in individual pans, you can find pans as they have on Amazon, if you don’t want to make individual quiches, I recommend using a 10-inch bakery ring to make your quiche in. Using a pie pan for quiche often means that that you sacrifice the height of quiche, a nice tall quiche means that you can enjoy the delicious tender egg custard in all of its glory. The directions for the crust are in grams. When I went to culinary school I finally learned how to make a suitable pie crust. By weighing your ingredients you will have the perfect crust every single time. To be honest, before I began to use a scale to make a pie crust, mine always turned out dreadfully. Kitchen scales are inexpensive, and the results will amaze you! When you make the quiches you can place them into either the individual pans or the larger ring. The ring does not have a bottom. You will blind bake the crust. This means you will partially cook it before adding in the custard. This will give you a fully cooked crust that will be flaky. You can use either pie weights, or you may want to simply prick the crust a bit before baking so it doesn’t rise up. If you don’t perform the blind bake the pie crust may not cook thoroughly. It may seem this may be a lot of work, but I promise you are going to love the results. I often make a quiche on the weekend and enjoy quiche every day for breakfast. For this recipe, I am going to write how to bake the quiche in two different ways. I learned how to bake a quiche using a ring. This keeps the quiche tall, so you can fill it with lots of ingredients. I feel baking the quiche in a ring adds a great deal to the quiche. Pie dishes are thinner, and you don’t get the opportunity to fill the egg custard full of cheese and more. I also feel that when you cook using the stainless steel mold the results are ideal. I think that the egg custard bakes better in the ring, your results will be an egg custard that is rich and creamy with a delicate texture. I personally think this is more realistic for a family or the home cook. I will also include directions for how to do this in small tarts that are sold in the restaurant. To make the small-sized quiches I would recommend some small tart pans where the bottom portion of the pan can be pushed through the top. This solves the problem of how to get the quiche out of the pan. Note, the cooking times will be less for the smaller sized portions. Love La Madeleine? Check out these copycat recipes from La Madeleine. Enjoy a great easy to make homemade quiche when you make one at home. Swap out the ham for bacon, or vegetables. 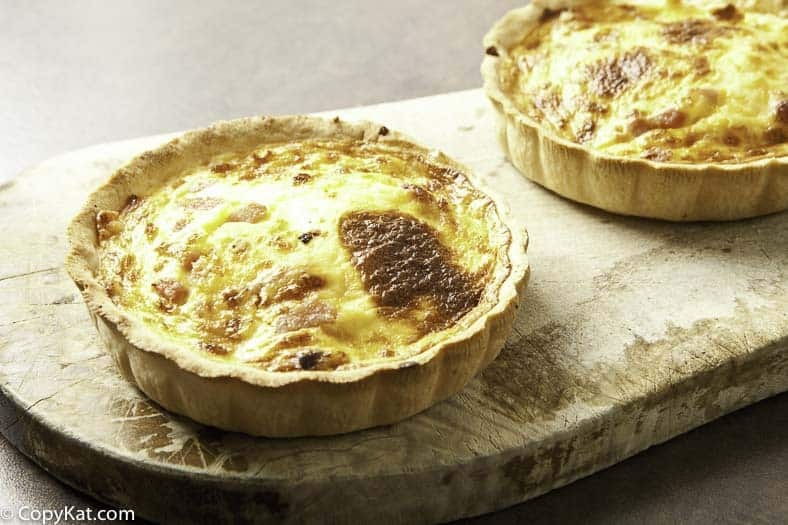 You can make the La Madeleine Quiche Lorraine at home. Prepare crust in the food processor. Add ingredients in this order: flour, salt, and butter. Pulse a few times. Add water and egg yolk, and blend until the flour forms a soft ball of dough. Ideally, refrigerate for at least 30 minutes before rolling out. Place a piece of parchment paper on a baking sheet. Roll out the dough in a large circular round. Loosely roll the dough around the rolling pin to help aid you in molding the dough into the ring. Take care not to leave any cracks. Blind bake this crust. Lay a sheet of parchment paper over the dough, and then fill the shell with dry beans or rice. You can purchase fancy pie baking weights, but they aren't necessary. Bake this crust for about 15 to 20 minutes. Do not let the crust get too brown. Remove from oven, and let cool slightly before adding the cheese, ham slices, and bacon. Prepare the filling by placing 2 whole eggs and 2 egg yolks into a bowl. Add heavy cream and milk. Stir until well blended. Directions will be for how to make a 1 large quiche, then how to make them into small tarts like La Madeline serves. Large pan recipe. When the crust has cooled slightly add in the shredded cheese, ham slices, and bacon. Mix up the custard mixture to make sure it well blended and then pour into the shell. Reduce the oven temperature to 350 degrees and cook for about 50 minutes. The quiche should still wiggle slightly when you remove it from the oven. It will set as it cools. Preheat the oven to 375. To make the smaller versions, roll out 4 or 5 rounds and place carefully into the tart shells. Poke the dough four or fives times with a fork to keep the crust from misshaping while baking. Bake for about 10 minutes. Do not allow the crust to brown. Reduce the oven temperature to 350. When the shells have cooled slightly fill with equal amounts of cheese, ham, and bacon. Prepare the filling by placing 2 whole eggs and 2 egg yolks into a bowl. Add heavy cream and milk. Stir until well blended. Fill with egg custard. Bake for 35 minutes. The quiche should still wiggle slightly when you remove it from the oven. It will set as it cools. This recipe is designed for a 10-inch baking ring, but you can use 6 individual pie tins, or this will make 2 shallow 9-inch quiches. You could swap the bacon and swiss cheese for broccoli and Cheddar cheese if you desire. I have made this six times now. Do I cut uo the ham and bacon? Is there a method to adding the cheese, ham and bacon, as in what order? The recipe for the crust uses the metric system because it is much more accurate for baking. Would like to make this could you kindly convert the grams & millimeters into cups and ounces it would be greatly appreciated. Why are there grams, millimeters along with cups, ounces? use one form or the other.It makes it annoying to use both.